Look who we found at the Garmin store on Michigan Avenue Thursday night. 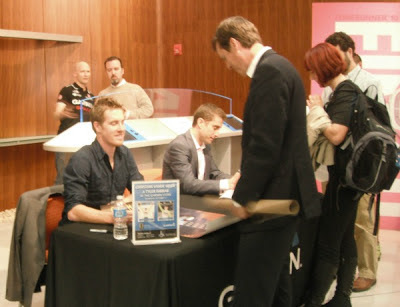 Tyler Farrar (seated left) and Christian Vande Velde (seated right) of Team Garmin stopped by to talk cycling, answer any questions the crowd threw at them and sign Team Garmin "Chicago" posters given to those in attendance. Now I realize this is far from a great picture, but if you want to see more from the event--and even catch me asking the CVV about the USA Pro Cycling Challenge, which he won--check out the write-up on the Garmin blog. In addition to learning that Tyler's specialty is sprinting, I realized that I really need to study my professional cycling. The audience was asking race specifics--why you charged when, what was it like having this happen--that were completely over my head. I know yellow jerseys, climbs, sprints, time trials and race names (some of the cyclists' favorites, like the Tour of Flanders, were learned last time Christian Vande Velde was in town), but beyond that, I was desperately searching wikipedia to catch up with the cycling aficionados. And then maybe next time I'll have a question that rolls off the tongue better than "what were your favorite sections of the USA Pro Cycling Challenge" or "what are some of your favorite Chicago-area roads to ride." But hey, that's what I wanted to know. What would you have asked these professional cyclists if you had the opportunity?